Former Wabash College basketball coach Bob L. Brock died Sunday afternoon at the age of 89. Brock served as the head basketball coach of the Little Giants from1953 to 1965. His 114 victories in 12 seasons are third on the Wabash all-time wins list. Brock came to Wabash after successful coaching stints at Richland Township, where he won two Indiana high school sectional titles, and Tell City High School, where he served as head coach for one season. As the coach of the Little Giants, Brock led his team to the NCAA College Division Regional Tournament in 1958, 1959, 1960, and 1961 — the only coach in Wabash history to take teams to four consecutive NCAA tournament appearances. His 1960-61 team defeated Butler University 68-61 to record the 600th win in Wabash basketball history. 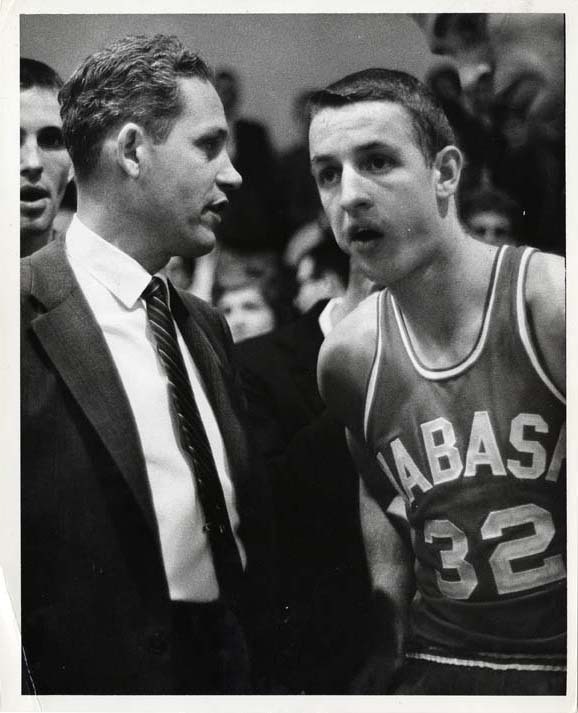 Brock (in photo left with star player Charlie Bowerman ’61) was inducted into the Wabash College Athletics Hall of Fame in 1989. A 1940 graduate of Clay City High School, Brock attended Indiana State Teachers College, where he played basketball for former Crawfordsville High School head coach Dave Glascock. Brock served in the U.S. Marine Corps from 1942 to 1945, serving in the South Pacific. After World War II, he returned to Indiana State to play for coaches Glenn Curtis and John Wooden. Bill Boone ’60, one of Brock’s former players, remembers his coach as a fair man who was an important part of his life. “I have thought a lot about my days playing for Coach Brock in the 50's,” Boone said. “I probably spent more quality time with my two basketball coaches, Coach Jack Hester at Ladoga and Coach Brock at Wabash, than I did with any other male figure in my life. "Coach Brock mentored many young Wabash men during his outstanding career," legendary scorer Charlie Bowerman ’61 said. "Evidence of his caring for his players off the court is demonstrated by the continuing relationship with so many after graduation. Former players always made it a point to stop and see Coach Brock during visits to Crawfordsville. "Coach Brock was a great tactician and strategist. His great achievements were always highlighted in games against Butler. Coach Brock developed a 'match up' zone which Coach (Tony) Hinkle of Butler could never quite figure out. One of Coach Brock's fondest memories was the five-overtime game in which Wabash defeated Butler 110 to 108. After that game Coach Hinkle informed Coach Brock that Butler would no longer be able to play a home and home game with Wabash. Coach Brock delightfully reminded Coach Hinkle that the contract between the two schools called for a home and home contest each year. One of the highlights of my career was having him as my coach and friend." Robert Wedgeworth, who also played for Brock, remembered his former coach's no-nonsense approach to the game. "Just before a home game at Chadwick Court an opposing coach came up to Coach Brock and asked if we were going to play the national anthem or say the pledge of allegiance before we start play," Wedgeworth recalled. "Brock said, 'No, we just sing "Old Wabash" and start the game!'" Brock is survived by his wife, Nadine Ley, along with their three children, four grandchildren, and two great-grandchildren. Funeral services will be held at Christ’s United Methodist Church on Friday, January 20 at 11 a.m. Burial will be at the Maple Grove Cemetery in Clay City. Calling will be from 4-7 p.m. on Thursday, January 19 at Hunt and Son Funeral Home, and one hour prior to the Friday services at the church. Memorials can be made to Christ’s United Methodist Church. 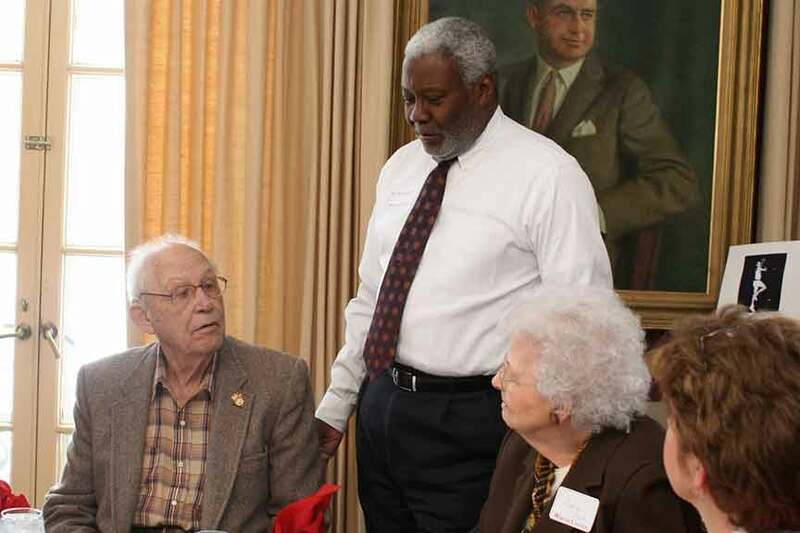 Photo right — Former player Robert Wedgeworth ’59 with Coach Bob Brock at a 2007 reunion of the Little Giant head basketball coach's former players.